PyxelEdit 0.4.6 is now available! The biggest change is 64 bit support on both Windows and Mac, supporting much higher memory use. Document saving is now done asynchronously on a background thread, which should help with the hiccups that happened on autosaving with large documents. Also, the slowdown issue is finally resolved. More changes below. 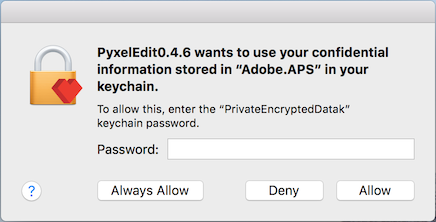 This is caused by the application trying to access the stored license info, but the new certificate doesn't match the one used previously. You may just click Always Allow (no password required) and it will work, but the recommended solution is to delete the folder ELS located in /Users/your_username/Library/Application Support/PyxelEdit/ that contains your license activation, and then activating the application again using the activation key from your license page, to avoid the problem reappearing the next time you update. 64 bit versions on Windows and Mac, with significantly higher memory use limits. Set default palette for new documents. Rough but functional user palette preset saving and loading (Color>Presets>Save current palette as a preset). Support for larger HD cursors. Right click context menu to document frame, with options to reveal the file in the OS file system or to close the document. Export selected part of document, accessible from the Export menu or using the hotkey Ctrl/Cmd-Shift-R. Experimental tile transform offset feature (enable in the Settings window). Fixed save failing when using "Save as..." on macOS 10.13 High Sierra. Fixed issue where the pen tool couldn't be used in the animation frame edit panel after deselecting until it was moved over the main canvas. Fixed canvas not getting redrawn when undoing a layer deletion. Improvements to stability on launching the program. Fixed issue where layers with less than 100% opacity didn't render correctly after changing document tile size. Hopefully fixed copy-paste issues on MacOS High Sierra. Fixed some hiccups that could occur during pen strokes. Made adjusters not give focus to the text field when using the slider (for pen and shape tool size, opacity etc). Made selection box and width/height indicator constrained to the canvas bounds when dragging outside canvas. Better autosave logic to get rid of unnecessary saves when documents have not changed, and better error messages on autosave failure. Made the window have a minimum size of 640x480, and made sure it is reachable on startup (not outside screen or begind taskbar/dock). On saving document, also check if the file path exists before deciding on using save/saveAs. Made document name get an incrementing suffix number when getting duplicated. Enter/escape key bindings for confirming/cancelling in document close confirmation dialog. Wicked man! Looking forward to download it! Congratulations, the program is still alive! Would it be very expensive to add the feature to save the configuration of the windows in each file ?.. I was going to ask if the development was still active on this before I bought it, well looks like it is. Great work! All of these changes were a welcome surprise with the latest update, I'm glad to see that they've been taken care of. Thank you! @Horst: I could make a 32 bit build without too much trouble if there is demand. It does still suffer from some of the memory limit problems the previous version had though, and background document saving is a bit unstable (but disabled by default). @TheMnk: Do you mean the locations of detached panels? Exact, location, size and all the customizable elements of each panel. "The file could not be saved: error #3001"
Ok, It seems that the problem is a conflict with the antivirus. Thank you for your great app. Enjoy it greatly. Finally got some time to give some feedback on the latest update. So far so good, I really liked the Solo layer option but I don't see any point in the Mute option since this can easily be done by clicking the view layer option so it's kinda redundant in my opinion, if there is a reason why this has been done, I would greatly appreciate to know it since it might help me at some point due to the possible fact that my use of the program still didn't to come to such a need. On the other hand I wanted to check if there would be a possibility to select a default color palette which would pretty much be an addition to the idea that @TheMnk had basically. @Skripta Thanks for the feedback. Yes, the mute is not super useful. The idea was to temporarily hide a layer without messing up the hidden state, when you have a lot of layers. I'm considering just having the solo feature, and making it a push toggle that solos the layer when held down. It is actually possible to set a default color palette now in the Color menu. @AdamEavy @Brendonm17, thanks for the kind words! I'm really happy to see it's still under development. My main issue with Pyxel is not having a hue/saturarion/value sliders and not being able to replace a color only inside selection. @BrendanToy Yes, I'm aware of the problem. It will be fixed in the next release! Thanks for the great work on this update, Danik! @Horst, there is now a 32 bit build available from the license/download page. Maybe it works better on XP?